Before I jump into this historic/summery/feminine space, let me do a quick introduction for those of you who are new to the Grit and Polish. I'm Cathy (hi!) and that beautiful human being is our 9-month old daughter, Daphne. She was born right here at the Farmhouse last July - all 9lbs of her - and we named her after her daddy, Garrett (middle name). She's had our entire family smiling ever since. Garrett and I have been renovating old houses in Washington state for a decade now. We got our start in 2008 when we bought our first fixer-upper in Seattle and quickly became DIY renovators, house-hackers, and landlords out of necessity. You can read more about our journey here. After years of moving into, renovating, and renting out old homes with our kids in tow, we retired at the ripe old age of 34 to an old farmhouse in the country. A decade later, we're still landlords, house-hackers, and DIY renovators and have shared our work on HGTV and the Home Love Network. Early-retirement and house hacking aren't terms you frequently hear on home blogs, but they're a big part of our journey and we hope to talk more about those going forward. We wanted to create a space for Daphne to grow into and that could do double duty as overflow guest space for our local Labor Day Rodeo and also for when we rent the Farmhouse out when we travel (yup, still house-hacking;). For those reasons, having a large bed in addition to the crib made sense. And when I found this beautiful cane bed pop up on Craigslist, I knew I had found the one. Did I mention it was also FREE...?! Yeah this bed frame is going to go down as one of our best Craigslist scores, ever! If you've been following our One Room Challenge, you know that we considered painting the bed frame. There's already a lot of wood in this room and I wasn't a huge fan of the finish on the bed. But now that I'm seeing the bed in the space, I kinda feel like an idiot for even considering paint. It's perfect as is! 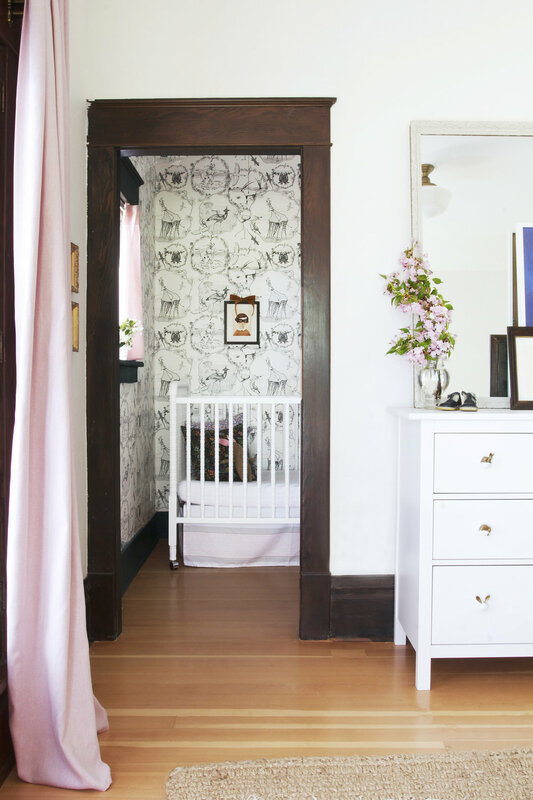 My goal for Daphne's nursery was a historic, whimsical, and youthful space that feels like a summer breeze and is comfortable for both Daphne and adults to spend time in. Lofty goals, I know, but I think we got just that. 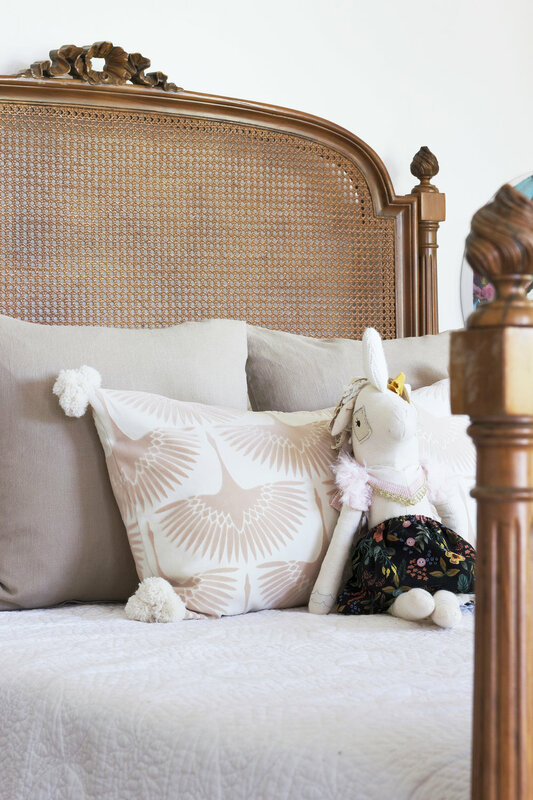 This room is comfortable, bright, feminine, and full of textures and patterns for little fingers and eyes to explore. It's youthful without being too kid kid, if you know what I mean. Thankfully we were able to use a lot of furnishings we already had, so we spent less than $500 on this One Room Challenge. We've been working on getting rid of stuff (despite my keep-it-because-you-never-know-when-you-might-need-it mentality) so I was happy to put some of our favorites to use. Like the leftover marble countertop from the Porch House kitchen on the nightstands. My grandmother's old mirror. The layered jute and wool rugs we bought for Brooks' nursery. Bedding, quilts, and pillows. Auntie Terr's crib skirt. The simple dresser. And the oversized glider that we DIYed last Fall. Using what we had meant spending less, consuming less, and throwing away less. A win-win-win. One thing we did buy was the curtains. 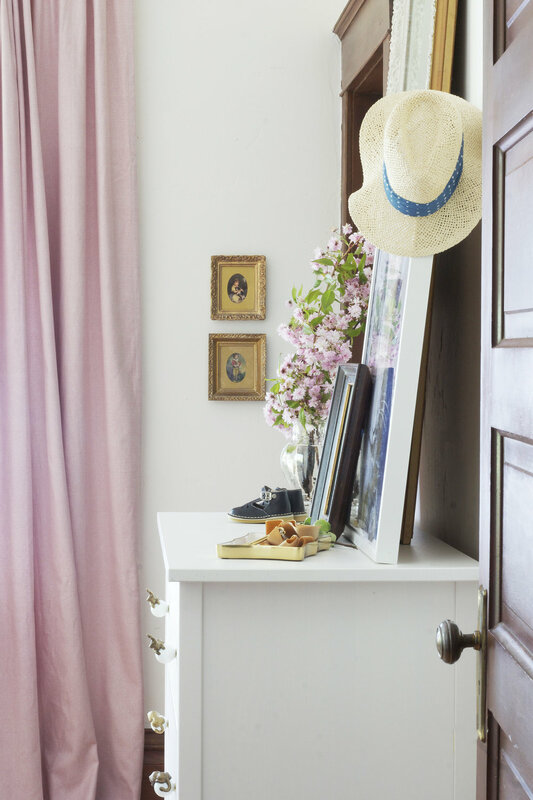 We found these pink cotton numbers at IKEA and they were $40/pair. 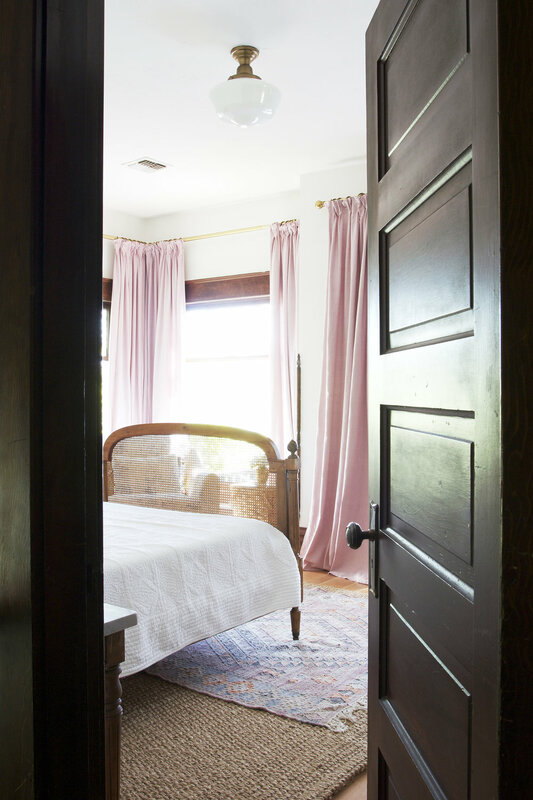 I also bought pleating hooks and added a stitch on each pleat to give the curtains a more finished, tailored look (you can see that DIY here). 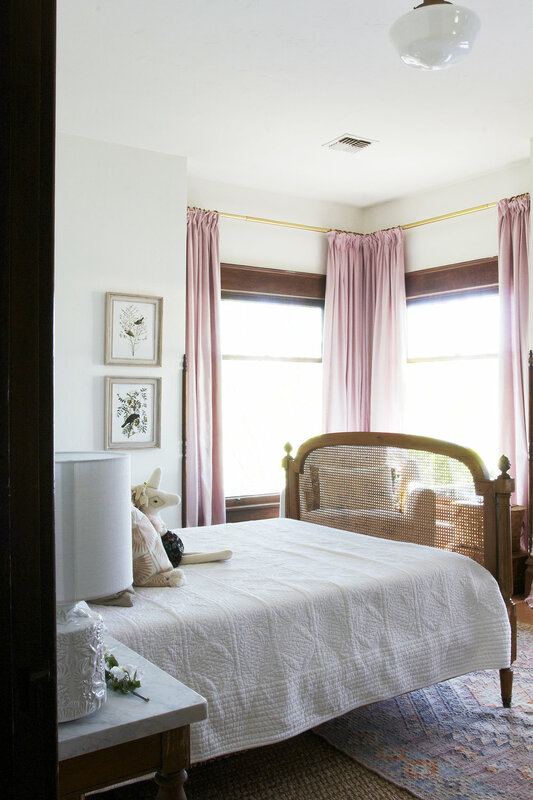 I had debated whether to go with a fun pattern or the pink, but in the end, I love how feminine and simple these curtains are. The crib nook is perhaps my favorite space in this room because I'm obsessed with sleeping babies. Really, there's nothing better in my book! We originally converted the closet to a sleeping nook for our second son. This small space is dark and quiet and Daphne sleeps really well in here. Eventually, when Daphne outgrows her crib, we'll move her to the full-size bed and turn the nook back into a closet. Every morning when we get Daphne up, she's standing at the side of her crib, staring at the wallpaper. It's such a fun print! And the graphic black and white is just right for little eyes. We bought it at Anthropologie a couple years back and I still love it. We ended up doing quite a few DIYs in this space. We updated the antique bed frame to accommodate a modern foam mattress. Garrett built the nightstands out of old table bases and marble remnants. We made the picture frames for the bird prints and masked girl. And I dusted off the sewing machine and sewed a number of the pillows in this room. I also made the poms on the bird pillow using alpaca yarn. Phew! 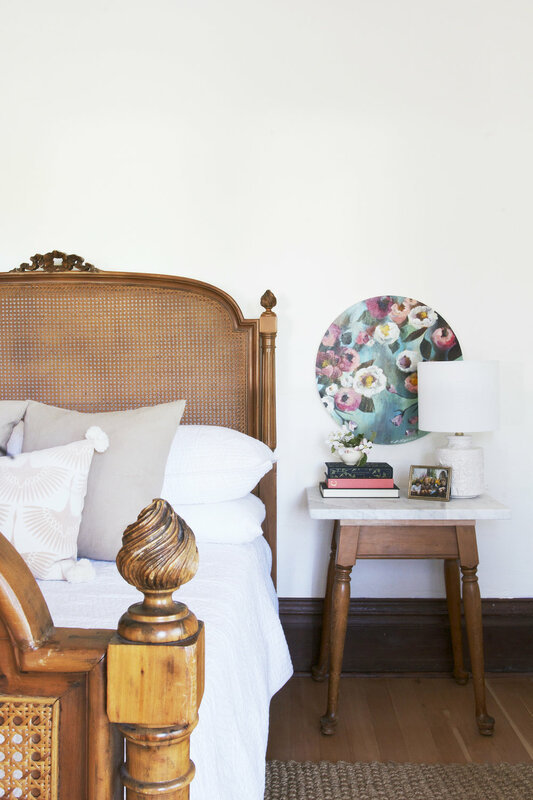 The round painting hanging over the nightstand was created by Kati Kleimola. 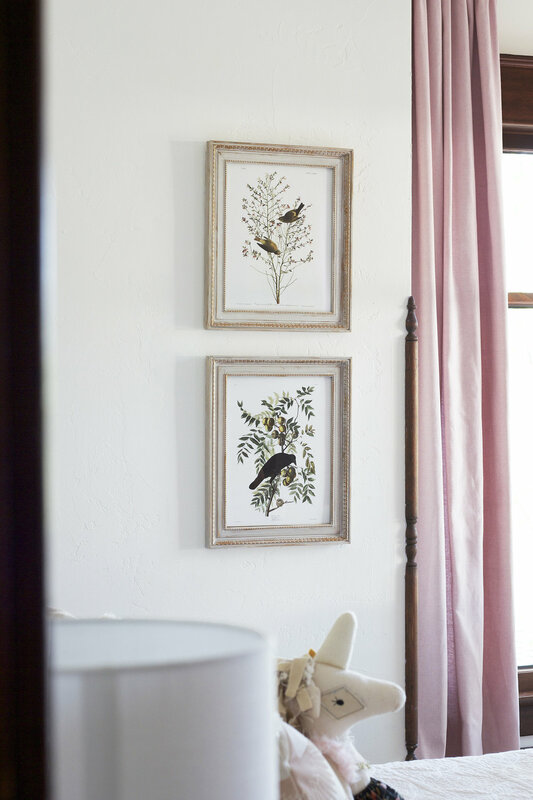 She's a talented artist and also happens to be doing her own One Room Challenge on her dining room. This painting is our first piece of original art at the Farmhouse and will definitely be a keepsake. Thank you Kati! The teacup on the books is from Daphne's great-great-grandmother. I tried to incorporate a few family antiques to give this space a sense of belonging and nostalgia. The photo is also of me and my siblings in my mother's summer garden here in Ellensburg, circa 1986. The rest of the art in the room is linked in the sources below. Thanks for following along on our One Room Challenge and we hope to see you around here in the future! You can also find us on Instagram, Facebook, and Pinterest. Check out all the other ORC room reveals here! *disclosure: We use affiliate links. If you make a purchase through one of the links, we may receive a small commissionat no cost to you. Affiliate links is one of the ways we keep this blog running, so thanks for supporting the Grit and Polish!